From street fairs to flower festivals and film screenings to wacky races, Santa Cruz offers a little bit of everything when it comes to annual events. For a community of its size, there is a constant stream of things to do, many of them outside and often with a drink in hand if that’s if you’re preference. 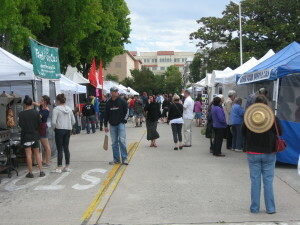 Greek Food & Cultural Festival – The Santa Cruz Greek Food & Cultural Festival is a three-day event in September that is set up each year on Church St. in downtown. Events range from live musical performances to community events and, as always, there is a healthy helping of tasty Greek food. The festival has been running for over 35 years locally and is complemented by the Greek Food Faire, which takes place in the Spring. Woodies on the Wharf – One of the largest classic car shoes in the Bay Area, Woodies on the Wharf offers locals a glimpse at more than 200 wood-bodied vintage cars. Held on the Santa Cruz Wharf in June each year, it’s one of the signature of events for a city that has come to be known for it’s surf and surf culture alike. O’Neill Coldwater Classic – Perhaps the most well-known annual event in Santa Cruz is the O’Neill Coldwater Classic. Held each year at the world famous surf spot, Steamer Lane, the Coldwater Classic attracts top surfers from all over the world to compete. It also attracts a large local crowd to West Cliff Dr. near Lighthouse State Beach to watch the action from close-up. 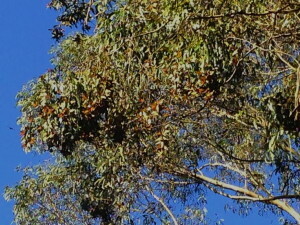 Monarchs at Natural Bridges – Each year, Monarch Butterflies migrate to the eucalyptus grove at Natural Bridges State Park and create an amazing, dreamlike sight for viewers. Hundreds of the butterflies cluster together in large clumps on the trees and start to become more active as the sun comes out, dipping and fluttering about the area. It’s definitely one of the top local experiences for outdoor lovers and you can learn more about it here. Clam Chowder Cook-Off – One of the biggest events at the Santa Cruz Beach Boardwalk, the Clam Chowder Cook-Off generally draws a jam-packed crowd to the beachside amusement park. Local chefs, often clad in strange attire, put out their best clam chowder, which is then judged by different categories: Boston & Manhattan style, amateur and professional. (There are also other categories to keep with the fun spirit of the event.) Attendees can buy a tasting kit to try the different offerings from local businesses. Wharf to Wharf Race – One of the hardest tickets to get in town is an entrance into the Wharf to Wharf Race. It sells out quickly, not just because Santa Cruz is a community that loves outdoor, beachside exercise, but also because it’s as much a celebration as it is a race. You’ll see entrants dressed in any number of colorful outfits, encounter get-togethers and music along the way, and get to soak up one of our marquee local events. Open Studios Art Tour – Open Studios is an event featuring hundreds of local artists displaying their work in local homes, businesses, and office spaces for the public to see (and buy, hopefully). The event is held each October over several weekends and locations are spread throughout town. You can find more information about the event here.